Yarr hoist the main sail as a new pirate game has been released as an updated version 2 on the C64. 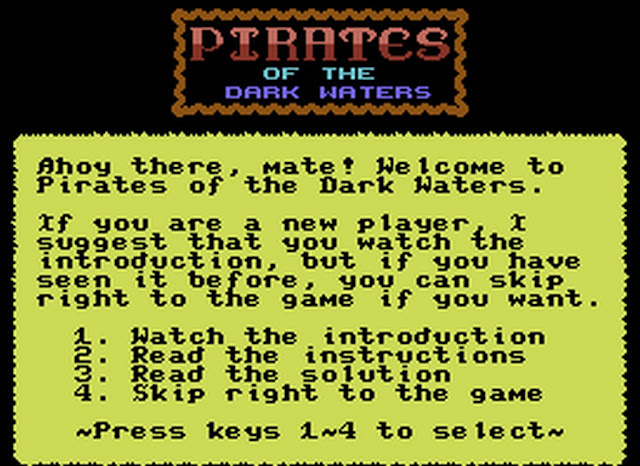 Titled as " The Pirates of Dark Waters V2 " and developed by Richard J. Derocher of Binary Legends, this is a text based adventure game created using Jon Mattson's Quest Writer and updated from the original version which was released in 2007. If you loved text based command adventure games then read on gamers as this one is pretty decent. The first thing that strikes you in Richard J. Derocher's game is the amount of effort that has been put into the story line to begin your adventure. It begins with a pirate melody and takes you through a story of disaster, as after offering to be a cabin boy on your uncles ship to defend a colony, the pirates of dark water attack and you wake up stranded on an island with no idea if your uncle survived. From then on the game puts you in your own adventure, and must use text based commands to follow the story and find out what actually happened. Thankfully many of the commands are right in front of you and there's no struggle to find out if a command is part of the game or not. For example " Go here " resulting in " I have no idea what you are talking about ". All in all it is a lovely game that I will be putting more time in at some point this week, it's just a shame I haven't come across any in game landscape graphics or music playing while I enter my commands. But other than that, It's a nice game that I would recommend you play, even if adventure games of this type are not your thing.